Update: You’ll now find full instructions for a tallit as well as a tallit bag, kippah, and other projects in the Sew Jewish book, available in paperback from Amazon and in PDF format directly from Sew Jewish. The tallit is the one sewing project (besides the curtains that hung in the Tabernacle and Temple and the priests clothing, I suppose) that arises from a Biblical commandment: the mitzvah to put tzitzit on the corners of four-cornered garments. (And having written that sentence, I realize this blog needs a glossary). We all know basically what a tallit looks like: a rectangular garment with knotted strings on the corners. But to get it halakhically right we went back to the Code of Jewish Law, the Shulchan Aruch, and the teachings of the modern Jewish scholar Aryeh Kaplan in his book, Tzitzith. The additional squares of colored fabric on the corners aren’t strictly necessary, so you could skip them and simply sew circles of stitches to reinforce the tzitzit holes. But I recommend including them. They help keep the tallit fabric from tearing, and they give you an excellent opportunity to personalize the prayer shawl through the material you choose. The atarah, or neckpiece, marks the top of the tallit so that you always wear it the same way. It’s also optional, but it’s another opportunity for personalization. For this tallit, we added a purchased atarah to point out that such things exist. 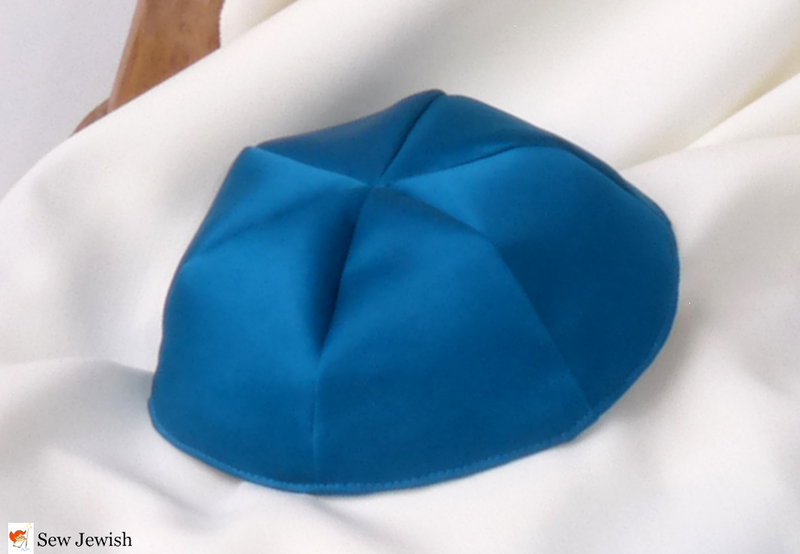 They give you design options and can make your life a bit easier (this one is the Jerusalem Bracha atara in slate blue from Emanuel Judaica). Another option is to make an atarah from the same fabric as the corner pieces (Update: We’ve now posted a free simple atarah pattern as well as patterns for more personalized versions in the SewJewish Shop on Etsy). 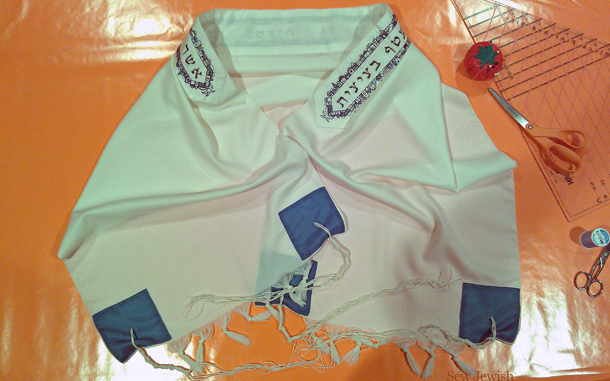 The completed size of this tallit is 64″x18″ (1.6m x 46cm), not including the fringe or tzitzit. This is a shawl-size tallit. You can use the same techniques to make a larger tallit, just starting with a larger piece of fabric. More about tallit sizes: How Big Should a Tallit Be? Want to know when we post new projects and patterns? Use “Follow the blog” in the side column. It only takes a few seconds. And we’d love to hear your comments. 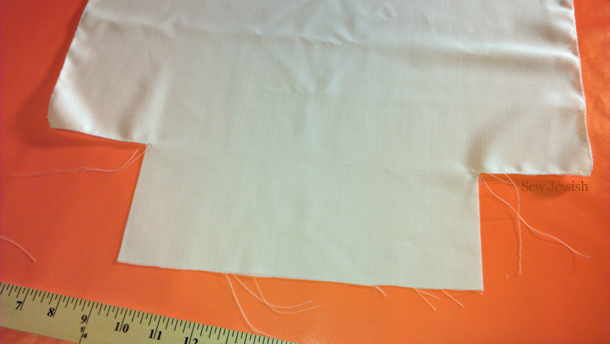 2 yards white wool suiting. This pure wool will appear slightly off-white. (For halakhic reasons, don’t substitute linen. The Torah forbids combining linen and wool in the same garment, and the tzitzit strings available to purchase are almost always wool.) I found the wool used in this project at Mood Fabrics. More about tallit fabrics: What kind of fabric can you use to make a tallit? Make a rectangular pattern, 71″x18″ (180cm x 46cm). You can use pattern paper, Kraft paper, wax paper, or pages from your Econ 101 notebook taped together. But don’t use anything with smudgy ink or pencil. Cut one copy of the pattern from the wool fabric. 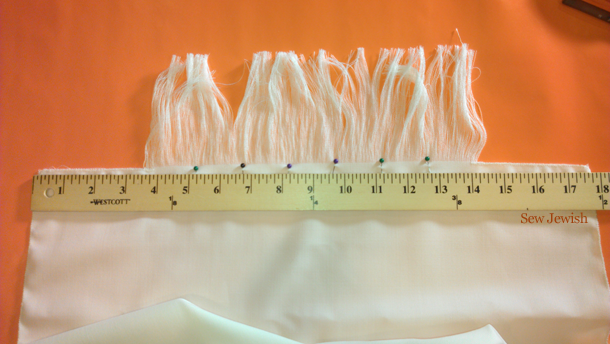 On each short end of the tallit, measure in 3½” (9cm), and remove a crosswise thread (a pin will help). Now you’re going to remove a square of fabric from each corner. 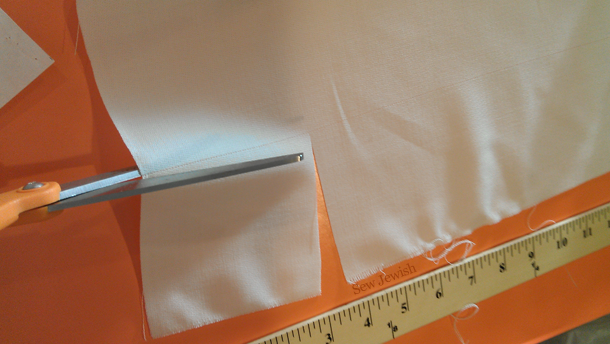 On each short end of the tallit, measure in 3 5/8″ from each corner. 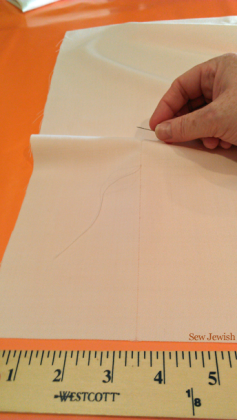 Use pins or a light pencil to mark a line up to the removed thread. Cut along this line, and then cut across the line of removed thread just up to the first cut. The middle section of fabric that remains on each end of the tallit will become the decorative fringe a bit later. With a sewing machine and using off-white thread, finish the edges of the tallit with zigzag stitches, starting and stopping about a half inch inside the fringe area. Remove all the crosswise threads from the fringe areas. A pin can help. This step can be a bit fiddly, but take heart. It won’t take that long. Use pins to mark off seven fringes, each a little more than 1½” (3.8cm) wide. Gather the threads for each fringe, twist them together, and tie them into a knot. As you tighten the knot, make sure the tallit can lie flat, and try to position the final knot about 1″ (2.5cm) away from the body of the tallit. Now for the corner pieces. Make a 4½” (11.5cm) square pattern. Cut four squares from the blue satin. Using the blue thread, baste ¼” (6mm) away from the edges. Press under the edges of the fabric along the basting. Pin the squares to the corners of the tallit, being sure to place the wrong (back) sides of the squares on the right (top) side of the tallit. (Note: If you’re making a large tallit rather than the shawl-sized tallit featured in this post, place the squares on the wrong side of the tallit. 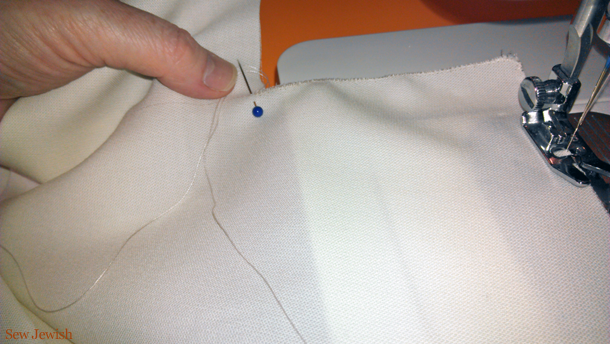 )Machine stitch the squares to the tallit, using blue for the top thread and off-white for the lower thread. Keep the stitches close to the edges of the squares. 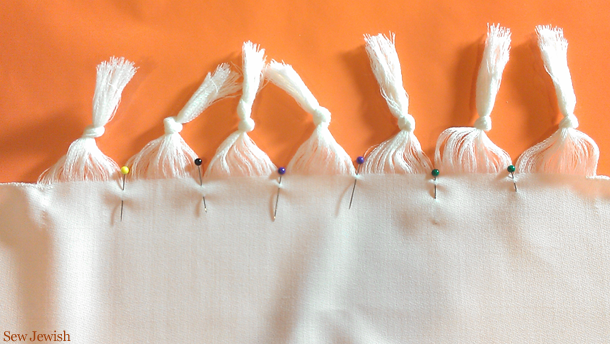 At each corner, determine the location of the hole for the tzitzit by measuring 2″ from the edges of the tallit. 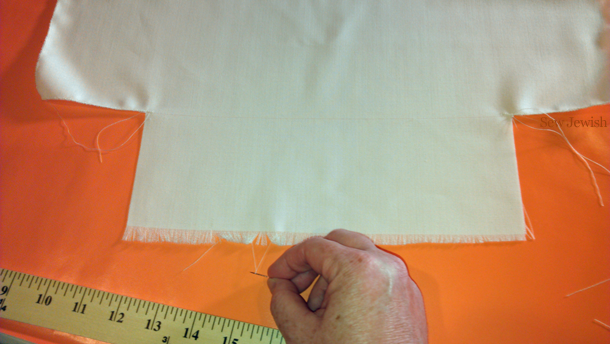 Be sure to measure straight across from the edges of the fabric, not diagonally from the corner. Mark the spot with a fabric marker or light pencil mark. Around this spot, draw a circle with a radius of 1/8″ (3mm). If your sewing machine has an eyelet feature, use that to sew an eyelet around the circle. Otherwise, trace the circle with a line of close, medium-width zigzag stitches. To make the tight curves, pick up the presser foot every two to three stitches, with the needle in the fabric, and rotate the fabric. For the best results, rotate the fabric while the needle is positioned on the outer edge of the circle of zigzag stitches rather than on the inner edge of the circle. For the best control, you might want to walk the machine through the stitches (that is, turn the manual control to move the needle up and down rather than pressing the foot pedal). Tip: If you have trouble with this free-style approach, we’ve now posted a pattern and placement guide and video for sewing the tzitzit holes. Working from the back of the tallit, fold the fabric at the circle. Being careful not to cut any of the zigzag stitches, use embroidery scissors to snip through the layers of fabric inside the circle. You don’t need to cut away all of the fabric inside the circle. You just need enough of an opening for the tzitzit strings to get through. Pin the atarah to the middle of one of the long edges. Using thread that matches the atarah as the top thread and off-white for the lower thread, sew the atarah to the tallit, staying close to the edge of the atarah. Tie the tzitzit to the corners using the video reference here. Now that you’ve added the tzitzit, try on the tallit. Looks great! Congratulations! You’ve made a beautiful tallit. Did you like this project? Please share it on Facebook or your favorite social media! Scroll down for the share buttons. 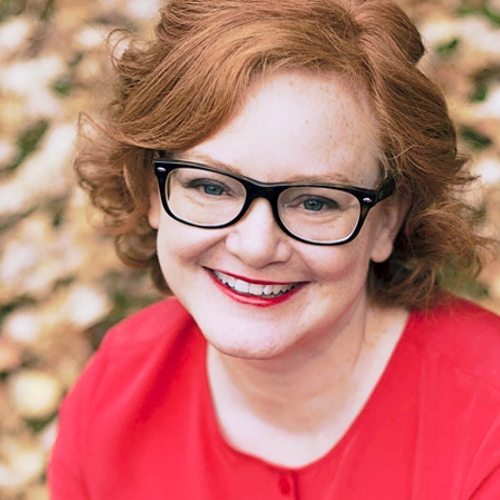 Maria Bywater is the author of Sew Jewish available from Amazon.com and in PDF format from Sew Jewish. She teaches hands-on Judaica sewing workshops. Tags: Aryeh Kaplan, bar mitzvah, bat mitzvah, free sewing pattern, how to make tallis, instructions for tallit, Jewish education, Jewish laws tallit, Judaica, make tallis, making tallit, Mood Fabrics, Shulhan Aruch, tallit, tallit design, Talmud, tzitzit. Bookmark the permalink. We are going to put a lot of effort into making sure that all the projects at Sew Jewish comply with Jewish law so that you can sew them and use them with confidence. The devil is in the details, as they say, but we believe you can find God there, too. If you need to finish the project in 2 weeks, I would recommend that you plan on making the atarah instead of purchasing it. You’ll find links to an atarah pattern in this post. Making the atarah to save time might sound a bit counter intuitive, but an atarah can also take time to arrive by mail, since many U.S. suppliers order them from Israel. Thanks again for taking the time to comment. We’d love to hear from you when your tallit is finished. If you use cotton for the tallit, how is it “kosher” with the wool tzizit? Hi, Sharon. There’s no kashrut issue with using cotton for the tallit. In fact, the type of tallit worn under a shirt, a tallit katan, is often made of cotton. So if that’s your preferred fabric, go for it! The issue I refer to in the post has to do with the Biblical prohibition against combining wool and linen in the same garment. (The combination of the two in one garment is called shatnez). The prohibition is stated in two places in the Bible: Leviticus 19:19 and Deuteronomy 22:9–11. I didn’t want to complicate the post with a lot of details, so I only pointed out where the issue comes into play for this project. But I think I’ll write a post about it in more detail. As a fulltime tallit dealer (Ben’s Tallit Shop), let me first say that I was very impressed with this post. Sometimes I even deal with established professional tallit makers who don’t seem to know how to adhere to the simple halachic requirements described very clearly in this post. Emily, regarding your comment on turnaround time from Israel: Israel Post just introduced a new international express mail service (“ECO Post”) that’s quite affordable and cuts down shipping time to a week or less. And then there’s always the EMS option, which will cost $20-$30 (or more) to the U.S. For those who do have enough time, registered airmail can be just $10 to Europe and the U.S./Canada. Regarding the atara, note that it should not be sewn on the same side as the corner patches – which is counterintuitive. The reason is because the fringed edges of the tallit are usually flipped up onto the shoulders (especially on a full-size traditional tallit). The corner squares are sewn onto the underside so that they show on top when worn. And a quick tip: If you make the tzitzit holes too small, or for some other reason have trouble inserting the tzitzit strings, just use a darning needle (or a little safety pin, if necessary). Ben, I really appreciate your tips. The post is now updated for placement of the corner pieces for a large tallit. Do I leave the edges raw or hem them in some way? Sorry, I just saw the answer to my own question (finish the edges with zigzag stitch). If you are making a traditional Tallit which is 4 feet by 6 feet, How do purchase fabric larger than a yard by a yard? Hi Joe. Look for fabric that is at least 48″ wide (you’ll find fabrics in standard widths of 54″, 60″ or more). Purchase 2-1/4″ yards. That will give you 6 feet plus additional length to make the decorative fringe like we did in this project. Thanks, Fawn. Making a tallit is very do-able. If you decide to give it a try keep in mind that you can always post any questions you have here. All the best! Thanks Maria, I am weaving my first Tallit for my Grand Son. Your information on the Atara, and Ben’s information on putting the Atara on the opposite sides have saved me from making a big mistake. I also would like to know how to hand sew the hole for the Tzitzit. Since I would like to make this without using a machine. Any suggestions would be most appreciated. From somewhere else I found measurements of 44×73 for someone who is about 5’5″ and I think that will be a good option as he will probably be about 5′ plus at his Bar Mitzvah, and I want him to be able to use it at least until I have to make a larger one for his Chuppah. I did silk painted Chuppah’s for my son’s weddings and appliquéd leaves on the Trees. They came out very well, and one now hangs framed in their house. The tallit and chuppah sound lovely! I’ve never sewn the tzitzit holes by hand, but my recommendation would be to use the buttonhole stitch –generations before us used it to reinforce buttonholes, after all. Having guidelines to mark the depth of the stitches can help in keeping them even. So my recommendation would be to draw an inner circle that will be the diameter of the hole and an outer circle to mark the depth of the stitches. I find that the inner hole should be a little more than 1/4″ in diameter–making it at least 5/16″ (8mm) helps get standard tzitzit strings through the hole without fraying the ends. The outer hole should be at least 1/8″ away, but choose a depth that will work with your fabric and heaviness of the thread. When marking the holes, use light markings. You may even want to cover the markings with the stitches to hide them. Stitch the reinforcing holes before you cut the snip the fabric away to make the hole. And when you snip the fabric from the center, you don’t need to cut the fabric all the way to the stitches. If you cut away most of the fabric, you can insert the nose of your scissors into the hole (with the scissors closed!) and push the remaining bits of fabric to the buttonhole stitches.